Undrafted free agent Kurtis Drummond had 12 career interceptions at Michigan State. 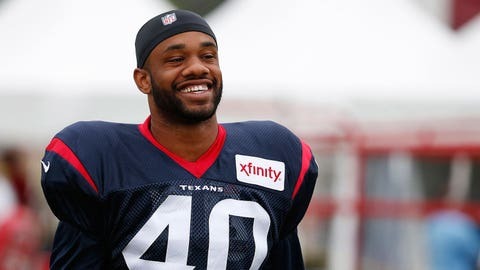 The Houston Texans promoted rookie safety Kurtis Drummond to the active roster on Tuesday, taking the spot of running back Arian Foster, who was placed on injured reserve with an Achilles injury. Drummond, an undrafted free agent out of Michigan State, had been on the practice squad after failing to make the 53-man roster in training camp. He played in three preseason games for Houston, recording eight tackles and an interception. Per Araron Wilson of the Houston Chronicle, Foster is set to undergo surgery, with his recovery expected to take six to nine months. The Pro Bowl running back was injured in last Sunday’s loss to the Miami Dolphins.